to bring you this hi-res screenshot of my action-packed schedule over the next few days. Yes, by the time you read this, dear reader, I shall be sedated and patiently awaiting the artful surgeon’s knife. While I am trying to maintain an air of casual disconnect about the whole experience, surgery is nevertheless … well, surgery! – and I expect to be out of it for a few days. But fear not – there are assorted surprises in store over the remainder of the week, including the finale of my travels in Punta Mita. (poor Punta Mita – interrupted now for the second time) And because I can’t eat or drink after midnight tonight – and probably won’t have much of a stomach for food tomorrow – I thought it important that this food whore get in a Last Supper, so to speak; a little something to tide me over for a while. And a little something to share with you, too. 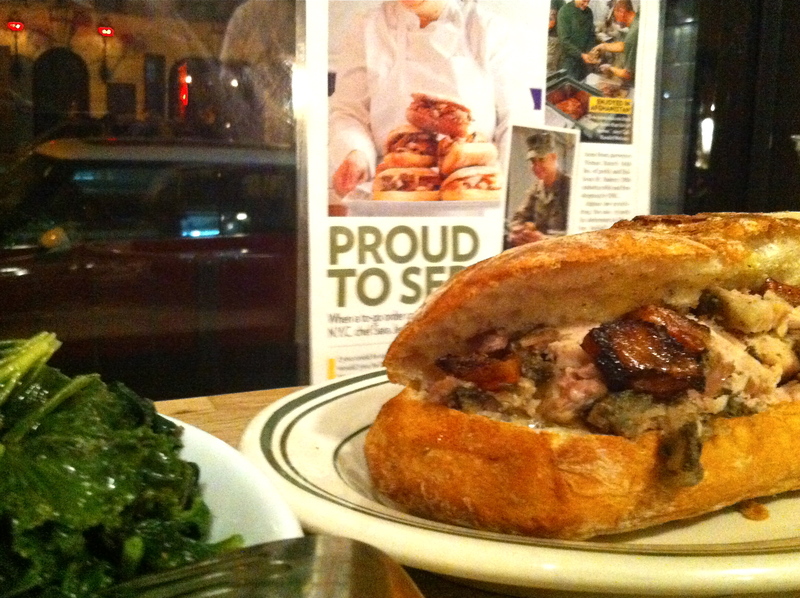 Down in Soho tonight inspiration took root while I was musing over the breads at Balthazar and I found myself hot-footing it over to Porchetta in the East Village for one of the namesake sandwiches of juicy Roman-style roasted pork with cracklings and herbs on a crunchy baguette. Throw in a side of cooking greens and it doesn’t get any better than this. Sarah Jenkins’ slider of a shop is barely large enough to hold the hi-tech roasting oven. It’s simple, it’s slow, it treats first-rate ingredients with a reverence that borders on devotion: who could ask for anything more?